Make sure you keep following Denny Gibson’s blog after the first day he hits the Lincoln Highway (his Day 9). Click HERE to continue with Day 10. 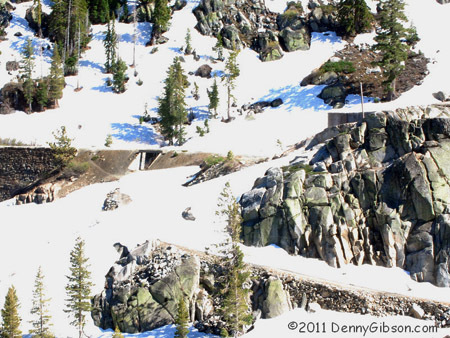 Highlights include encountering snow at Donner Summit (note the LH “Subway” beneath the railroad overpass just left of center) and an adventurous ride along the sometimes perilous Kings Canyon Road (on a tour led by Nevada LHA director Jim Bonar). The Reno Gazette-Journal reported about a bike trail that will incorporate seven miles of the old Lincoln Highway near the California-Nevada border. 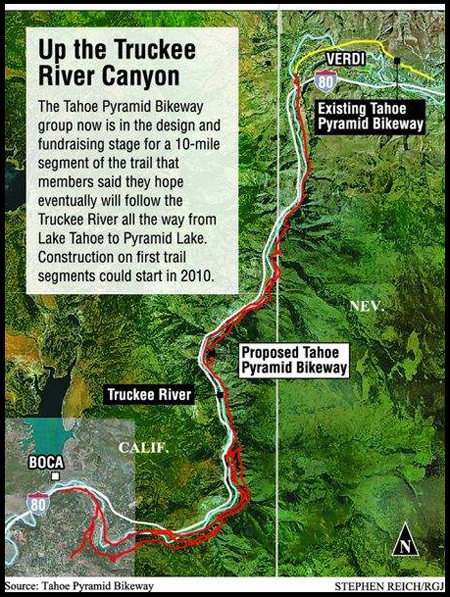 For now, that section is the biggest missing link in the Tahoe-Pyramid Bikeway, a 116-mile path that follows the Truckee River from Lake Tahoe to Pyramid Lake. The new part will be routed along I-80 and dirt roads from Boca Reservoir to Dog Valley Road in Verdi. Janet Phillips, who founded the group of volunteers working on the project, said of the 10 new miles, seven miles will be on old roadbed from the Lincoln Highway and three miles of new construction will be required. 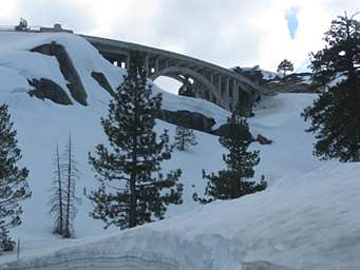 Phillips said, “There’s a huge transportation history in that canyon and we are going to bring some of it back to life.” A big obstacle was cleared December 10 when the Truckee-Donner Recreation and Park District Board approved an environmental study for the project that was required by California. Dennis Crowley just returned from walking the Lincoln Highway from Sacramento to Take Tahoe. He sent the summary below plus I’ve included some of the photos he’s posted online: the first shows him on the original 1914 pavement now on private property in Eldorado Hills. 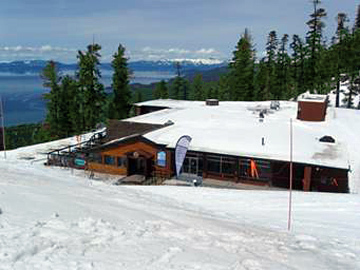 The third photo is in the vicinity of Strawberry, Calif. 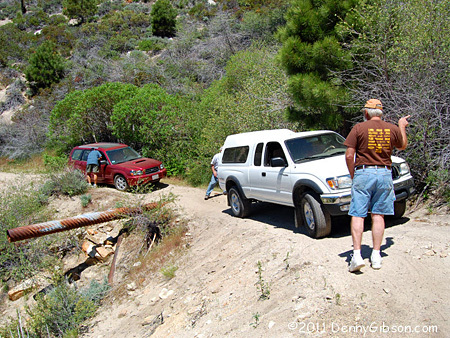 This leg into the Sierra Nevadas started with urban sprawl but soon turned to speeding traffic on the twisty, narrow, and very steep highway that often had little or no shoulder, all while Dennis pulled his 100 lb. trailer. Of course, the descent towards Nevada had its own challenges! The words of Brian Butko summarized my last walk on the Lincoln Highway from Sacramento to Lake Tahoe far better than I ever could have: “That’s a long uphill climb!” No truer words were ever spoken for many reasons. For reasons still unknown to me, I managed to sprain both ankles two weeks before taking on my second walk of the Lincoln Highway a few weeks ago. Thanks to taking things slow and a triple-digit heat wave in the Sacramento metro area that kept my muscles heated up when I walked, I soon found myself admiring the majestic beauty of Lake Tahoe. Besides the obvious challenge this journey was to be the first time I would use the trailer, now affectionately called, “The Man-Wagon” by my neice Amber to camp which meant being without any support vehicle for several days and pulling approx. a hundred pound load behind me. So to say, “That’s a long uphill climb” was the perfect ending and perfect summary to a journey that, in the end turned out to be a huge success. From 1998 through 2005, Crowley walked and worked his way across America from Chicago to California on Route 66. He now calls the effort Cross Roads, “a single purpose and a simple message. 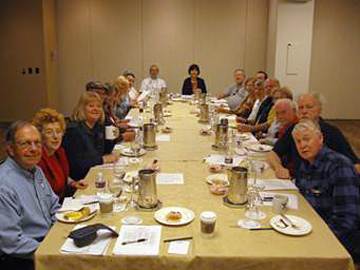 By promoting America’s historic highways Cross Roads seeks to call attention to our country’s Christian heritage. The purpose for covering these highways on foot is to make the statement that America needs to return to and walk in her spiritual ‘old paths.’” He walked his first segment of the LH a year ago. Read more at www.walkingamessage.com/ or search this site for “Crowley” to read of his Lincoln Highway adventures. To request his four email updates written as he was walking, contact Amber at aherrington@walkingamessage.com/. Here’s a site that makes KCR look stunning but, they’re on bikes. The road is hard-packed dirt and rock, with very few sandy spots along the first 3 miles. During this time, the grade is fairly steep, giving the rider a good aerobic workout. After a couple switchbacks, the road contours along the hillside and makes for a small saddle, which marks the end of the steep climb and the beginning of the longer, easier gradient. The road stays pretty much on contour for the next 5 miles, with very minor dips. 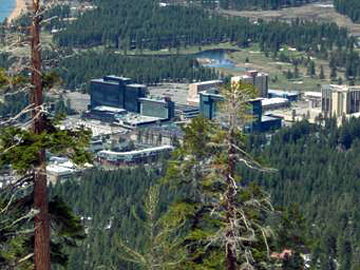 A few hundred feet below through the pine trees is Highway 50 to Spooner summit, but traffic noise is almost non-existent. Depending on the season, there are a few sandy spots along this section, but nothing serious. The final mile includes a quick steep climb, and then you pop out just above the NDOT highway maintenance station on Spooner. Note: this road is drivable with a 4WD and high clearance, so don’t be surprised if you run across motorcycles, ATVs, and Jeeps. Finally, here’s a link to a topo map that can be enlarged even more once yo’re there by clicking a magnifier.